Order your quality tray of "Alaskan Bald Eagle" now! Have this image as a tray! We usually ship within 48 hours, and by "standard mail" with Canada Post. Within North America you should expect your order within 1-2 weeks, however please be aware that it can take longer. Unfortunately we can not guarantee how long shipping will take and are therefore not responsible for any delays caused after the item has left our hands. At this stage we are only able to ship within North America for our shipping flatrate. Please inquire if you plan to order a product which needs to be shipped to a destination OUTSIDE of North America. If you wish to have your item shipped by Express (extra shipping cost) please send us a email immediately after you receive your paypal receipt. All our products are for PRIVATE USE only. It is not permitted to duplicate or use them commercially in any way! (8x12 inch) Individually handcrafted on Vancouver Island these stunning tile serving trays are created from the superb combination of beautiful cedar wood, and real ceramic tiles featuring vivid photo images by Artist Rolf Hicker. 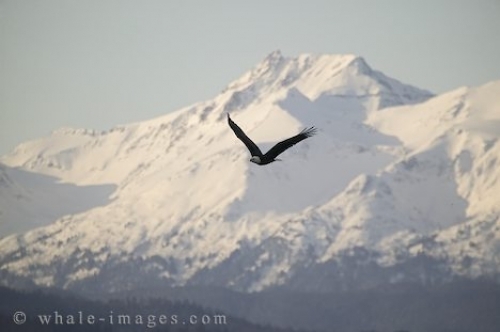 Photo of a bald eagle cruising past the Alaskan mountains in Homer, Alaska.